In a market full of cookie-cutter multifunction inkjets, the $200 Brother Business Smart MFC-J4510DW (copy/fax/scan/print) is a little special. Where most printers are oriented to feed letter-size paper length-wise, the MFC-J4510DW stores, feeds, and prints it sideways. That means the paper path is 11 inches wide instead of 8.5 inches wide, so the unit will also handle larger paper, up to 11 by 17 inches, fed one sheet at a time through the rear of the unit. It's a novel approach that also allows for a shallower-than-normal footprint. Brother provides a 3.7-inch touchscreen to facilitate control of the MFC-J4510DW. For the most part, options are presented in intuitive locations and in logical order. The driver dialogs for the unit are nicely realized as well, and PaperPort SE is included for scanning chores. Push scanning is available, but only via USB. The MFC-4510DW may also be connected via ethernet or Wi-Fi. The MFC-J4510DW has a good overall design. It comes with a bottom-mounted, 150-sheet paper cassette. On top, there's a foldout, 20-sheet ADF (automatic document feeder) for scanning or copying longer documents. The printer prints in duplex, but the ADF doesn't duplex; Brother provides the option to scan both sides using the letter/A4-sized flatbed and printer-based prompts, but that’s not ideal for longer documents. The unit is solidly built, carries a two-year warranty, and has a recommended page volume of 250-2000 pages (duty cycle is 13,000 pages). The Brother MFC-J4510DW prints text and monochrome documents quickly, and photos at an adequate pace. On the PC, text pages emerged at a rapid 12.3 pages per minute (ppm), and on the Mac, 12.8 ppm. Four-inch by six-inch photos printed at about 4 ppm on plain paper using the default settings, and 2 ppm to glossy paper. A full-page photo prints in about 38 seconds. Scan speeds are excellent at about 2 ppm. The MFC-J4510DW can produce very nice output, though you must select Best mode for optimal results. In default mode on plain paper, text and simple graphics looked good, but photos looked washed-out; and we observed either a precise white line or a precise overlap line where the printhead either over- or under-shot as it passed over the page. Switching to Best mode seemed to remove this risk--and improve photo quality on plain paper. Photo quality on Brother’s own paper (where Best mode is the default) is as color-accurate as that from any printer you'll find in this price range. 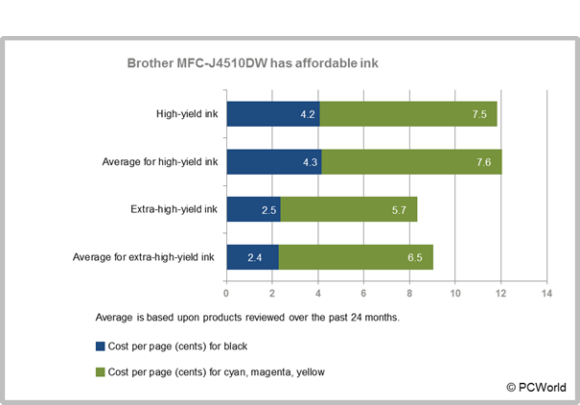 Ink costs for the MFC-J4510DW are very affordable. The high-yield, 600-page LC103 cartridges cost a midrange 4.2 cents per page (cpp) for black and 2.5 cpp per color. With the 1200-page, LC105 series XXL cartridges, costs drop even lower, to 2.5 cpp for black and only 1.92 cpp per color. That's a four-color page for only 10.5 cents with the LC103 regular supplies and 8.25 cpp with the XXL LC105 cartridges. The Brother MFC-J4510DW is a capable all-around unit that looks nice and takes up less than the usual amount of space. The controls are nicely done, ink is very affordable, and the speed is adequate for a small or home office. It definitely belongs on your short list. The HP Photosmart 7520 costs the same and has a few advantages in print quality and features, but its inks are not quite as cheap. Brother's MFC-J4510DW is a fast, innovative inkjet multifunction that handles large paper sizes, produces nice photos and is easy to use. There's also automatic duplex printing and an ADF, and best of all: affordable ink.